Show support for your favorite team or player with a high quality full color photo! This 8x10 features a composite of the stars of the 2006 Los Angeles Dodgers, and will look great displayed in any fan's home or office. 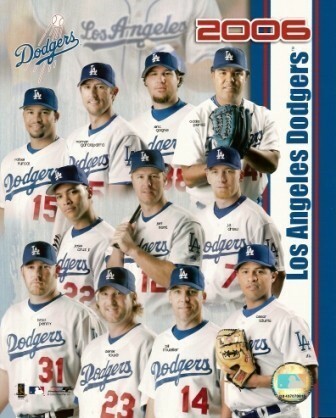 Featured in the photo are: Rafael Furcal, Nomar Garciaparra, Eric Gagne, Odalis Perez, Jose Cruz, Jr., Jeff Kent, J.D. Drew, Brad Penny, Derek Lowe, Bill Mueller, and Cesar Izturis. Check out related items below to add a wood plaque with acrylic cover to display this great picture, or have it professionally framed and matted by Collectibles of the Game. Many other players available, order up to 10 or more 8x10s and pay one price for shipping!